The legendary MYSTIFIER return with their long-awaited new album 'Protogoni Mavri Magiki Dynasteia'. The first new album in over 17 years from the Brazilian horde is a deadly dose of ultra- satanic blackened death. Their brand of profane and primeval metal reigns true, and has outlasted three decades of trends and turmoil. 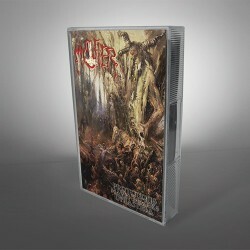 MYSTIFIER are pillars of the true metal underground, and 'Protogoni...' is another spearhead in their renewed assault.